Senseless tragedy. Inexplicable attacks. Fear, pain, and sorrow. Our first instinct is to speak in terms of alternative absolutes: right and wrong, freedom and terrorism, and, of course, good and evil. We have specific names, faces, and ideologies to help us attempt to identify and define what we otherwise cannot comprehend. Without a doubt, these bombings yesterday at the end of the Boston Marathon were actions that are heinous and deplorable. They were wicked and malevolent. They were evil. I lived in the greater Boston area for five years, and have friends in the area–one of whom planned to be in those very grandstands yesterday before changing her plans. We have a hard time even naming what it is that we see in a time like this. But what if the problem is bigger than we realize? What if the solution is bigger than we dreamed? What if our struggle is with not just a few individuals or groups, but with this very age in which we live? And what if our only means of rescue lies in the actions of another? The events yesterday can join an ever-growing litany of stark suffering in the modern world: September 11, the Asian tsunamis of 2004 and 2011, the Newtown shootings, the Darfur genocide, and a host of namelessly insidious and systemic ills (war, famine, slavery, disease…). Yet as varied and diverse as these are, they have one thing in common. Symptoms of something deeper and more pervasive. They are ugly, twisted, and painful. They confront us and confound us. We know these symptoms when we see them, but we are at a loss to explain why they are here. We know the symptoms, but do we know the source? Sin has not just corrupted our individual desires and actions; it has stained the very fabric of creation. The defining characteristic of this present age is sin, and the defining characteristic of sin is death. They are universal because of the Fall. We live in a fallen world and we are all complicit in the evil of this age. “All have sinned and fall short of the glory of God” (Romans 3:23). Sin is not confined to any one gender, age, or nationality. Evil shows itself everywhere because sin shows itself everywhere. We are not unwilling bystanders who lament the effects of sin; we are those who participate in it ourselves to one degree or another. We live in this age, from which we desperately need to be rescued. That rescue, ultimately, cannot come from efforts of Seal Team Six, the FBI, CIA, TSA, NSA, or Homeland Secruity. It will not come from electing the right official, enacting the right policy, or engaging the right enemy. This doesn’t mean that these things aren’t beneficial and even necessary—it just means that in and of themselves they are not capable of fully delivering us from this fallen world. First responders can save us from the symptoms, but not the source. That is the unique work of Jesus Christ, and something that he alone can accomplish. In Christ’s death and resurrection we see God fully confronting the brutality and lethality of this sin-sick world. In Christ’s death and resurrection we see God doing what we could never do: deliver us from this present evil age by shattering the rule of sin and stripping bare the power of the grave. It is precisely in Christ’s resurrection that the decisive powers of this present evil age have been exposed and defeated. The Risen Lord has laid bare the now futile fury of Satan’s best weapon, and freed those who are captive to sin. He has rescued us from this present evil age by initiating the age to come. As Timothy George said, in the resurrection, “The future has invaded the present”, because we have a promise, a pledge, and a preview of will one day be for all of those who are in Christ. In Christ, we have a sure and certain hope even in the midst of the suffering, sin, and evil of this age. The sting of death has been removed. The worst thing that this age can throw at us has been rendered useless. The promise of a new and restored age has been secured in Christ’s resurrection. This present evil age will give way to the age to come, where every wrong will be set right, every injustice atoned for, and every tear wiped from our eyes by the God who dwells in the midst of his redeemed people. This does not mean that Christians are to blithely sing about the “sweet by-and-by” by trivializing or minimizing the reality of the suffering we see. We don’t close our eyes, tap our ruby slippers together and whisper longingly that “there’s no place like home”. No, we must speak the life-giving words of the gospel into the death-dealing actions of this present evil age. We must “mourn with those who mourn” (Romans 12:15). We must confidently, consistently, and joyously point others towards the redemptive work of Christ and look expectantly to that day when the age to come is fully ushered in through Christ’s return. 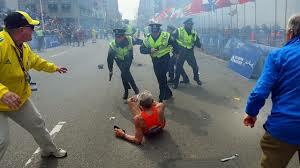 Yesterday in Boston we were once more clearly shown the forces at work in this age. We were shown with horrific clarity the brutal senselessness of a sin-sick world. Events like this do not introduce evil into this world, but they do pull back the curtain and reveal it to us in stark and shocking fashion. The only thing we can do is also the best thing we can do. We can turn to the promises of the gospel and rejoice that the reign of this age has been ended in the resurrection. We can grieve, we can pray, and we can confess the evil that resides in our own hearts. But we can also look to an empty tomb outside of Jerusalem and rejoice in the fact that Jesus Christ has delivered us from this present evil age. For that reason, with Paul, we offer glory to our God and Father forever and ever. Amen.